Now, lets meet the staff! Jaystar stated... wrote: This is Jaystar, one of the lead administrators. She is the one who does the technical maintainence around here. 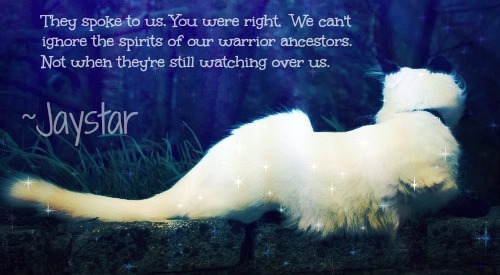 She also roleplays Silentclaw, of Starclan, and Moonsong, of Shadowclan. She is known around here for her high-strung, sincere personality but she is known for being strict as an administrator. Offline, she is a junior in high school, who is a honors student. Jaystar loves to do Color Guard and Karate as extracurricular activities. On her free time, she enjoys roleplaying, drawing and coding. She has always wanted to pursue a career in the IT field, either as a Network Security Administrator or a Graphic Designer. Though, even with her dreams, she is always happy to assist anyone who needs a friend! This is Fallenstar, founder of the site and one of the Lead Administrators. She doesn't know a lot about the technical aspects of the site.... yet, but she is very creative when it comes to roleplaying and the plot lines. She also roleplays as Poppystripe (and her kits, for now) of ShadowClan. Despite her main character's arrogant and often cruel disposition, in real life, she is really sweet. She won't stand for nonsense going on around her site, though, so watch out because she is a strict Admin (though maybe not quite as strict as Jay). Offline, Fallenstar is a senior in high school and just turned 18. She is planning to go to college for at least a Master's Degree in the Geological Sciences. Fallenstar doesn't have much of a life beyond the internet and school, but she does enjoy writing and drawing in her free time. It was this passion for writing that drew her to the Serenity River Pack -the wolven role-playing game that led her to the idea of creating this wonderful site. Fallenstar is often called crazy by her best friend, who also enjoys being crazy with her. She is spontaneous and creative, and when you find her in the chatbox, she is most likely dancing around or "glomping" someone. But she is always willing to help anyone who comes along, even if she might not know how to fix a technical problem.